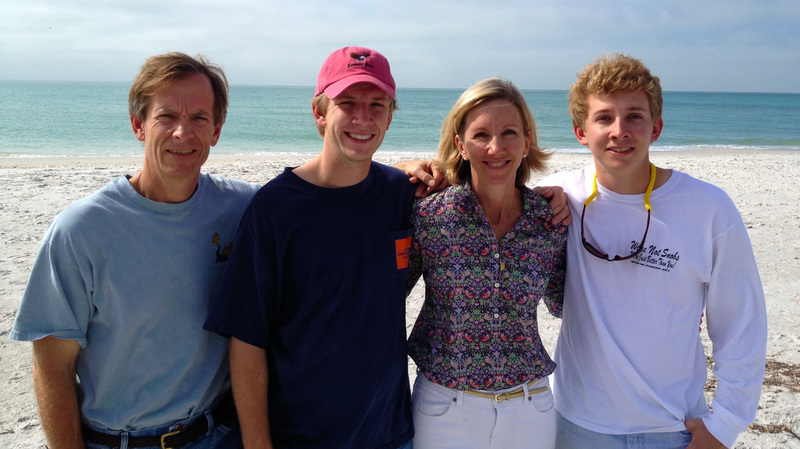 The Hastings Family Fund was created by John Hastings (left), son Harrison, wife Sarah and son Andrew, a senior at UM. When it comes to generosity toward the University of Mississippi School of Engineering, the Hastings family of Houston, Texas, is a shining example. The Hastings (John, his wife, Sarah, and sons Harrison and Andrew) made an initial unrestricted gift of $15,000 for the greatest need within the Department of Geology and Geological Engineering. Recently, the couple donated an additional $5,000. Both gifts were made through their Hastings Family Fund. With these two gifts, geology department administration and UM Foundation staff collaborated to create the Department of Geology Faculty Support Fund specifically to address anticipated teaching needs and opportunities. The financial support has already enhanced tailor-made classes and programming for the department and the engineering school. This decision required two GE faculty members, Terry Panhorst and Robert Holt, to invest several weeks of their own time in Oklahoma and New Mexico to develop field exercises. Two camps were held: an introductory one and a more advanced camp. Thirty-eight students attended the first session, and 21 students were in the second session. The advanced camp (GE 401) will be operated by Holt, an associate professor. Based in Santa Fe, New Mexico, the camp runs during the first half of August. About 35 students attended the inaugural session. “The camps are designed to give the students experience in the field with basic geologic procedures, such as measuring and describing rock units, creation of geologic maps based on field observations and application of engineering fundamentals to evaluating sites for development,” Panhorst said. Giving to Ole Miss engineering comes naturally for the Hastings. John is a lifelong geologist and has immensely enjoyed his profession. Both sons are pursuing careers in geology and geological engineering. Andrew is a senior geology and geological engineering major at UM. Hastings worked for Shell Oil Co. from 1984 to 1994 and for Edge Petroleum from 1994 to 2005. He is owner and executive vice president of exploration for Paloma Resources LLC. He graduated from Dartmouth College with a bachelor’s degree in earth sciences and from Texas A&M University with a master’s degree in geology. The Hastings’ donation has already proven very beneficial to the program, said Panhorst, who spent the week of spring break in Oklahoma attempting to find suitable places for meaningful projects where he and about 40 students could gain access. “Altogether, I spent about 16 days in the Oklahoma field area, spread between January, March and April, attempting to generate a coherent set of projects,” he said. Charitable gifts are the foundation for many School of Engineering activities.